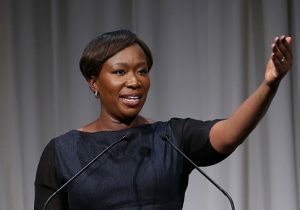 MSNBC host Joy Reid wrote a dozen blog posts from 2007 to 2009 containing homophobic conspiracies and jokes, according to recently resurfaced internet archives. Reid's old blog posts—initially tweeted by Twitter user Jamie_Maz and then reported by Mediaite—show a fixation on former Florida Gov. Charlie Crist, who Reid joked was a closeted gay man. At the time of the blog posts, Crist was a Republican. Crist switched parties and became a Democrat in December 2012. Reid joked Crist was being encouraged to run for office "now that he's married to a girl." "Now that he's married to a girl, Charlie Crist is being sought out for all KINDS of good stuff … [The GOP] are wooing Miss Charlie to run," she wrote. Reid also claimed Crist spent his honeymoon dreading physical relations with his wife. "I can just see poor Charlie on the honeymoon, ogling the male waiters and thinking to himself, ‘god, do I actually have to see her naked…?'" Reid wrote. Reid also said that Crist married a woman to increase his chances of being Sen. John McCain's (R., Ariz.) running mate in 2008. "When a gay politician gets married, it usually indicates that he is highly ambitious, and desires to put himself in a position to move up the power ladder," Reid said. She used the tags "gay politicians" and "not gay politicians" sarcastically in posts about Crist as well. Reid referred to Crist as "Miss Charlie" in 12 of her blog posts and mocked him as Will, a gay character from the television show "Will and Grace." Reid issued an apology for her "insensitive, tone deaf and dump" remarks on Sunday afternoon. "This note is my apology to all who are disappointed by the content of blogs I wrote a decade ago, for which my choice of words and tone have legitimately been criticized," Reid said in a statement shared with NBC News, which, like MSNBC, is owned by NBCUniversal. "In addition to friends and coworkers and viewers, I deeply apologize to Congressman Crist, who was the target of my thoughtlessness," she added. "My critique of anti-LGBT positions he once held but has since abandoned was legitimate in my view. My means of critiquing were not." Back in June of this year, Reid criticized House Majority Whip Steve Scalise (R., La.) after he was saved from multiple gun shot wounds by a black lesbian police officer, because he co-sponsored a bill that would amend the Constitution to define marriage as being between a man and a woman. UPDATE 12/4/2017: This article was updated to reflect Reid's apology issued on Sunday afternoon.